Heather has taught my three children piano, clarinet and music theory for nine years. We are very happy with her teaching style, in that she adapts to each of their personalities and needs, and her flexible approach has allowed each of them to grow and improve at their own pace. Heather has offered many opportunities for public recitals and competitions, but has never put pressure on them to perform. She is supportive, responsive and conscientious, and is a talented musician and teacher. I would recommend her unreservedly. Heather Morris is a multi-faceted, dynamic musician who brings all of her musical experience – performance, theory & composition and pedagogy – to bear in her studio. She combines a well-rounded offering of piano repertoire “classics” with refreshing doses of more contemporary pieces (including her own! ), keeping her lessons fresh and engaging. Above all, her high energy and cheery personality make learning and lessons a fun experience! Heather came highly recommended to us by another highly-regarded teacher, and we are happy to recommend her to others! Thank you so much for all you've done for Ryan! You were his first 'music' experience. It's been wonderful. You were so patient and kind. We couldn't have asked for a better start for him. 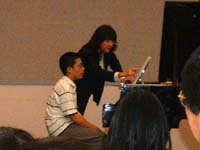 Heather has really inspired my son, a typical high energy, athletic 8 year old who has never played piano before. Adam does well with the fun and challenging lessons that Heather puts together for us each week. She is very consistent in her expectations and really sticks to the schedule we set. We've really enjoyed hearing him play piano for us, especially because we don't have to remind him to practice! Thanks so much! The love for music starts, not with learning the notes or scales, but with passionate and devoted instructors. Heather Morris has been a true inspiration to Taariq through her passion for music and her truly unique compositions. It is a unique individual that can instil such dedication in a child that he practices without being told, progresses in leaps-and-bounds, and plays from from his soul. Heather for your talent we admire you, for your dedication we thank you, and for your love of music we are grateful. I just really wanted to let you know how wonderful it feels to have Triana come back so inspired and happy from her lessons with you. Last Wednesday she came straight to the piano to show me her pieces and shared details about them with me in such an enthusiastic way. She appreciates you so much. Heather Morris has guided me back to the gift of playing piano music, something I once had but threw away as a reckless adolescent. She is a gifted teacher who has allowed me to find my own way, but at the same time set markers down to ensure that I have advanced. 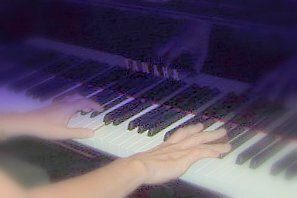 The result is that, less than a year back at the keyboard, I am playing at a level that I can feel good about, and even sometimes use to entertain friends and family. Since that's the whole point of playing the piano, I can't ask for any more. I want to thank you so much for being my piano teacher for all these years. I have learned a lot from you about improving my work ethic and the importance of practice, as well as the rich history of the instrument itself, and, of course, how to play it musically. . . Music is definitely something I want to continue with, and you have given me the tools that I need. Tom Parkinson-Morgan (high school senior). I began taking lessons from Heather at age 56. Although I'd played as a child, I needed to start at the very beginning. Heather is patient, encouraging, and clearly explains theory and technique. She assigns a variety of beginning pieces that are musically rewarding to play. Her love of music is infectious, and lessons are enriched by her broad knowledge of music theory and history. Just wanted to say thanks for doing the workshop yesterday. I've gotten a lot of positive comments from parents and students. We so enjoyed hearing your lilting melodies and beautiful playing. The art of composition is so interesting and you gave us an inside look at how it works for you and the pictures and stories that inspire you. Cheryl and the MTAC board. Thank you for your presentation last night. I was captivated straight away - you had me in the palm of your hand. Your music is lovely and I can't wait to play it.